We need volunteers to interpret the Mill each weekend – Spring, Summer, and Fall. This fun opportunity is a great way to assist the National Park Service to keep the mill’s doors open, meet new people, and express your passion for milling history. 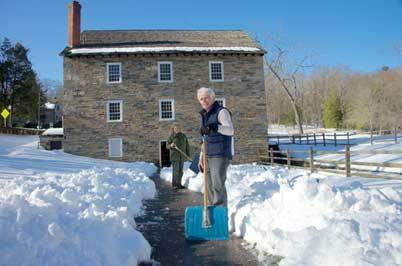 For as little as six hours a month, you can be a volunteer at Peirce Mill. Sign up today using volunteer@friendsofpeircemill.org. Volunteers bring the history of Washington to life for visitors of all ages. If you have a desire to share your love of history or interest in explaining how our ancestors lived this is the job for you. 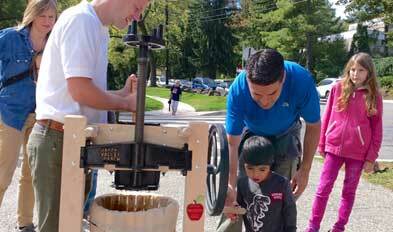 Pressing apples by hand Heritage Day 2015. Looking for a more active role? A water powered mill has lots of wooden gears and leather belts in need of regular maintenance. In the spring and summer volunteers assist with trash removal and cleaning. Friends President Quentin Looney assists miller Jeanne Minor in clearing the snow before a school tours the mill.